﻿ Portugal 5-1 Cameroon. Historical Ronaldo can't wait for Brazil! 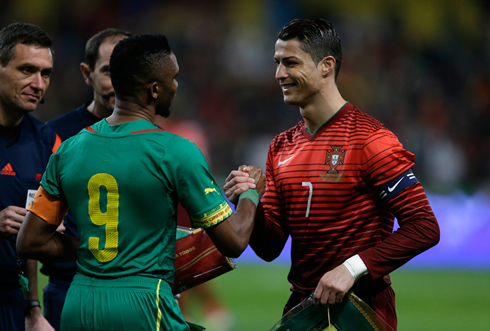 02.03.2014 » Portugal 5-1 Cameroon. Historical Ronaldo can't wait for Brazil! 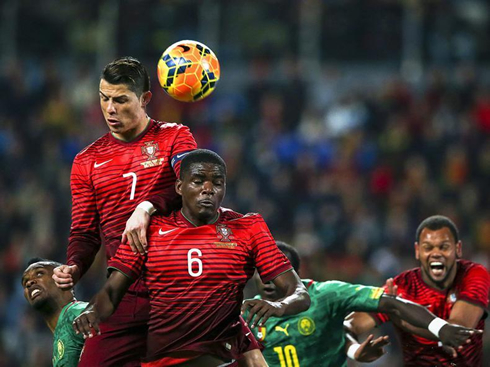 Portugal has passed the test against Cameroon this Wednesday night and crushed the African side with a clear 5-1 win. As usual, Cristiano Ronaldo led the troops and scored the opener and the last goal of the evening. With these 2 goals, the 29-year old forward became Portugal's all-time top scorer with 49 goals, leaving Pauleta in second with 47. Raúl Meireles, Fábio Coentrão and Edinho scored the remaining goals for the "Selecção". 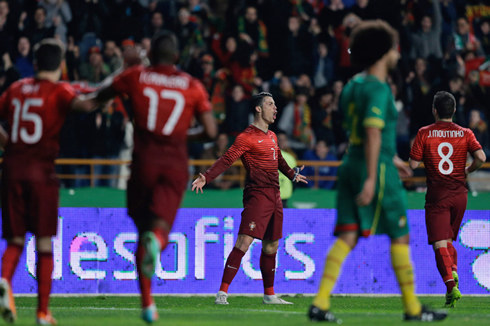 Portugal's first game in 2014 finished with an emphatic win over Cameroon, after a 5-1 beating in Portuguese soil. The match was hosted in Leiria and the 21.000 spectators that made their way to the stadium got to witness a historical moment when Cristiano Ronaldo scored the opener, as it allowed him to surpass Pauleta and become Portugal's top goalscorer of all-time. After an even first half where the scoreline didn't go beyond the 1-1, the hosts dismantled Cameroon in the following 45 minutes and with that, they've made a strong statement about their future campaign in Brazil's 2014 FIFA World Cup. The second-half goals came in through Raúl Meireles, Real Madrid's Fábio Coentrão and Edinho, delivering Portugal their largest win since that 6-2 victory against Bosnia-Herzegovina, achieved on November 15 of 2011. Tonight's game has been Paulo Bento's last test before he announces the list (on May 19) that will contain the 23 players selected to travel to Brazil and that will represent Portugal in the 2014 FIFA World Cup during next summer. With that in mind but also due to a great amount of injured players, the hosts' starting eleven brought us a few surprises and certainly some unknown players to many out there who don't follow the Portuguese league very closely. Ivan Cavaleiro (SL Benfica) and Rafa (Sporting de Braga) made their debut for the Portuguese National Team and they both started the game in the attack, next to the Real Madrid's star, Cristiano Ronaldo. It was while wearing Portugal's new kit and jersey especially designed for the next 2014 FIFA World Cup that Cristiano Ronaldo broke the deadlock in Leiria and immediately became the highest goalscorer in the history of the Portuguese National Team. It all went down in the 21st minute, in a fast attacking play led by AS Monaco's midfielder, João Moutinho, who decided to leave the ball over to João Pereira, right after the full-back had appeared in his support close to the right side-line. Pereira crossed it low to the middle and once the ball landed on Cristiano Ronaldo's feet, there was not much Cameroon's defense could do anymore. The Real Madrid forward got rid of a defender with a great first touch while receiving the pass from his teammate and then fired it into the low corner of the goal, making it 1-0 to Portugal. At that stage of the game, the visitors weren't playing that bad yet and it wasn't that weird to see them reaching the equalizer just a couple minutes before the referee's whistle for half-time. However and as strange as it may sound, it wasn't Chelsea's Samuel Etoo scoring it, but rather Lorient's forward, Aboubakar. The 22-year old player exploited a temporary poor positioning from Portugal's back line (Fábio Coentrão in this particular situation), chested down a pass from Makoun and calmly struck it past Beto to put things even in Leiria. Portugal didn't find their rhythm over the first 45 minutes and Paulo Bento had good reasons to be unsatisfied with his players' performance during that first half. However, the Portuguese coach didn't make many changes to his team straight away, as he decided to only switch goalkeepers (Eduardo for Beto) and replace the newcomer Rafa for Edinho. Portugal would regain the lead in the 65th minute, capitalizing on a big mistake made by Chedjou, who saw his pass being intercepted by Raúl Meireles close to the edge of Cameroon's box, when the visitors' goalkeeper was completely out of position. The former Chelsea midfielder controlled it, kept his cool and easily struck it into an almost empty net. After that Cameroon's gift for Portugal's second goal, things just went downhill for the visitors. The minute after Meireles goal, the hosts would manage to extend their lead and this time the goal came from an unusual goalscorer, Real Madrid's left back Fábio Coentrão. The assist man was the debutant Ivan Cavaleiro, who had the chance to show just a bit of his class in a simple but highly effective low pass to Coentrão, allowing the 25-year old defender to score his 3rd international goal of his career, with an accurate left-foot strike from close range after a good overlap. The fourth goal of the night started on Raúl Meireles' feet and with a bouncing pass to Cristiano Ronaldo on the left wing, who had been left with plenty of room to run forward just as he likes doing. After pickig up the pass, the Real Madrid star ran with the ball ahead a few more meters, brought it inside and looked for space to hit the target his left foot. His shot ended up being blocked by Cameroon's goalkeeper, but the rebound fell to Edinho on the far post, who had to simply tap it in, with no one already standing between him and the goal line. The count was closed with another Cristiano Ronaldo goal, this time assisted by the former AS Roma left-back, Antunes. The game had been being played for 83 minutes already, when Antunes escaped his opponents to go down the left wing and send a low cross back to Cristiano Ronaldo. Just as he had done in the opening goal, CR7 managed to find enough space for his right foot near several Cameroon defenders and struck the ball hard into the back of the net. 5-1 to Portugal and that was Cristiano Ronaldo's 49th goal for his home country, who is now Portugal's all-time leading goalscorer. Attackers: Rafa, Cristiano Ronaldo, Ivan Cavaleiro. Cristiano Ronaldo next game for Real Madrid will be against Levante for La Liga, on March 9 of 2014. You can watch Juventus live stream, Real Madrid vs Levante, Valladolid vs Barcelona, WBA vs Manchester United, Chelsea vs Tottenham and Arsenal vs Everton, all games provided from our football live section.